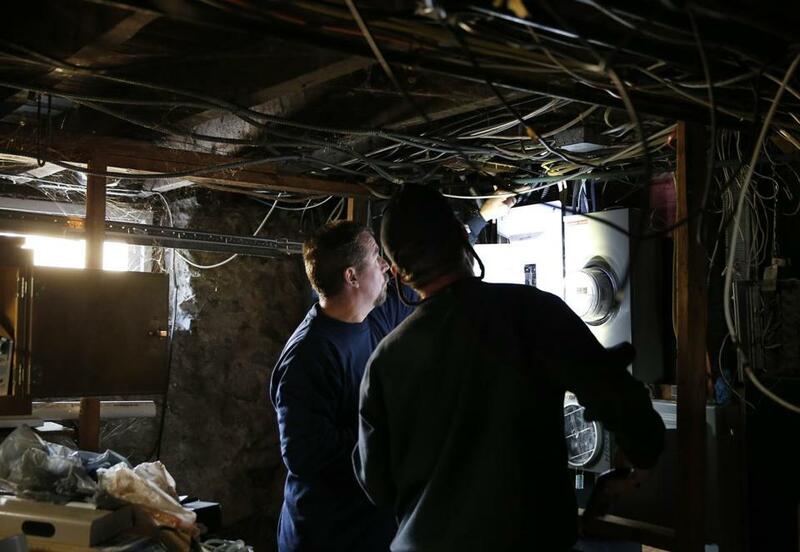 Electricians inspected a panel in the basement of a home in Lawrence. ANDOVER — Massachusetts officials Wednesday cast doubt on the likelihood Columbia Gas would meet a Nov. 19 deadline to restore service to some of the thousands of residents who have been without heat or hot water since the September explosions and fires rocked the Merrimack Valley. Lawrence Mayor Dan Rivera acknowledged that the work replacing appliances and heating systems is going much slower than expected because so many older homes have plumbing or electrical systems that are outdated or not up to code. “We’ve been sensing the date has been in jeopardy the last couple of days, and we owe it to the people doing the work to get their assessment right,” Rivera said. So far, 842 residential and business customers have had gas service restored, out of more than 8,400 that lost service. Governor Charlie Baker said emergency response officials are conducting a “where are we” analysis and plan to issue an assessment of the timeline as soon as Friday. “I think it’s fair to say at this point, there’s more work to do,” Baker said Wednesday after meeting with business people from Andover, North Andover, and Lawrence who lost gas service, and in some cases, much more, in the Sept. 13 gas disaster. Meanwhile, Attorney General Maura Healey hit out at Columbia Gas, citing “frustrations” with the recovery effort that include poor communication with customers and inadequate scheduling and planning and a “lack of progress as winter weather approaches.” Members of her staff plan to met with utility executives Thursday. Although Columbia Gas had rapidly replaced much of the 45 miles of underground gas mains and thousands of service lines to properties in the three communities, getting individual buildings “house ready” has proved to be a struggle. Joe Albanese, a construction company executive and former Navy Seabee commander tapped to lead the restoration effort, said in a recent interview that only about 10 percent of properties are house ready, compared to most of the gas mains and nearly two-thirds of service lines. In many cases, plumbers and inspectors have had to bring units up to code before installing new appliances and relighting the gas service; he cited one incident in which crews had to rebuild stairs to access the work area. “It’s not just about replacing a boiler and replacing a hot water heater. There’s a lot more to it,” Albanese told the Globe. Albanese said crews would be “ramping up” efforts to get customers’ houses ready; there were 204 plumbers, 343 gas fitters, 111 electricians, and 404 field workers deployed earlier this week. While Albanese would not say if the recovery effort would meet the Nov. 19 deadline, Columbia Gas spokesman Dean Lieberman asked for patience as the utility updates scheduled work to get to the elderly and families with small children first. “This is an incredibly complex logistical undertaking, and new challenges emerge daily that we work through with all of our partners,” Lieberman said in a statement. “With the construction on the pipelines ahead of schedule — 86 percent of the work is done — we are now shifting resources and bringing on additional support to increase the productivity and pace of the home installation process. Columbia Gas announced the Nov. 19 deadline in late September when it revealed a massive recovery plan involving thousands of workers. A plan to provide residents with space heaters was scrapped days later out of safety concerns, and Columbia has instead made hundreds of trailers, apartments, and hotel rooms available. Rivera said a slip from the Nov. 19 deadline is understandable, given the age of the housing stock in his city. But he also emphasized the recovery work has to be done carefully and safely, even if that means extending the deadline, and he called on Columbia Gas to update residents with a realistic deadline. “We all know the incredible complexity of getting people house-ready. At the end of the day, it was so complex in getting it right, that it bears review,” Rivera said. The reassessment comes amid growing frustration across Andover, North Andover, and Lawrence, as residents have endured construction work that has taken over streets and clogged traffic and cold nights without heat or hot water. And colder weather is on the way. As of this week, 6,863 people, from nearly 2,000 families, are in alternative housing such as hotel rooms, apartments, and trailers. “We are still in a disaster area, this is still disaster recovery,” Rivera said. Meanwhile, Baker announced that $2 million has been committed to the Merrimack Valley Small Business Emergency Loan Fund, to provide quick funding to tide businesses over while they wait for Columbia Gas to pay their claims. The announcement took place at Yella Restaurant in Andover. Co-owner Danielle Berdhan welcomed the loan fund and community support, saying she and business owners and residents have been struggling.